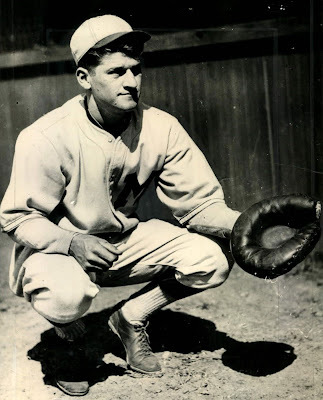 Borchert Field: Bill Brenzel, "Handling that Funny Stuff"
Following the 1935 season, the Brewers released combative catcher George Susce, whose talent for getting into fights had finally eclipsed his talent for handling notoriously-wild Brewer knucleballer Forrest "Tot" Pressnell. To fill Susce's role, they purchased Bill Brenzel from the Cleveland Indians. "Pressnell is the knuckle ball pitcher? I don't mind handling that funny stuff because I was initiated into that society long ago. Walter Kinney had a knuckler that was the most baffling I've ever seen. In fact, the knuckle ball he threw did so many tricks I used to wear a mask when I warmed him up." Brenzel worked out with Pressnell in the off-season, and when the 1936 season opened he was behind the plate. It was a good pickup for the Brews; with Brenzel backing him up, Pressnell went 19-9 in 1936, leading the Brewers to the American Association pennant. The Brews then steamrolled through the playoffs, leaning heavily on the knuckler and his backstop. They swept the Kansas City Blues in the first round of the playoffs, then toppled the Indianapolis Indians, four games to one, winning the right to represent the American Association in the Little World Series. 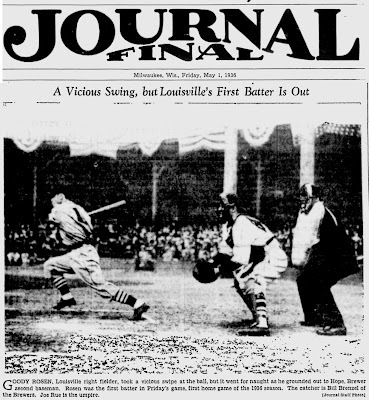 There, they dispatched the Buffalo Bisons in five to claim the minor league crown for Milwaukee and put a cap on a magical season. That fellow really crowded a whole season's work into the last two weeks of play. Bill went to town in the two play-off series and against Buffalo in the little world series. In the games he caught Brenzel worked against the International leaguers; he convinced me he is a capable handler of pitchers. Why, in that last game in Buffalo, Bill was perfect — he did not call one bad ball from Pressnell. Tot, you'll recall, gave only two hits until he lost his stuff in the sixth. As much as the Brews valued Brenzel's handling of the knuckleballer, he had more to offer his new club. 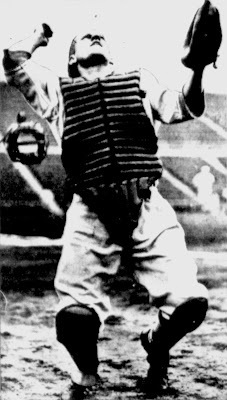 Sothoron would often rely upon the catcher, who came up through the Pacific Coast League, for scouting information on West Coast players. In early May of 1936, the Brewers were considering acquiring center fielder "Frenchy" Uhalt from the Yankees organization. Sothoron sought out Brenzel's opinion of the California native, whom he had played against in the Pacific Coast League. Brenzel gave Frenchy a strong recommendation, and the Brews completed the deal. Uhalt came through that season, hitting .322 and establishing Brenzel as an excellent evaluator in the eyes of Milwaukee brass. After the 1937 season, Pressnell was sold to the Brooklyn Dodgers. His savvy with the knuckleball no longer needed at Borchert Field, Brenzel was sent back to the PCL, this time the Hollywood Stars. Brenzel was one of the best mechanical catchers in the minors. Always a weak hitter, he managed to stay in double A leagues for the last decade because of his ability to handle pitchers. Brenzel took his other great ability and moved into scouting, first with the Cardinals from 1947-50 and then with the Dodgers from 1951 through his death in 1979.